People facing kidney failure who are medically qualified for transplant surgery have two basic options: stay on dialysis or get a transplant. 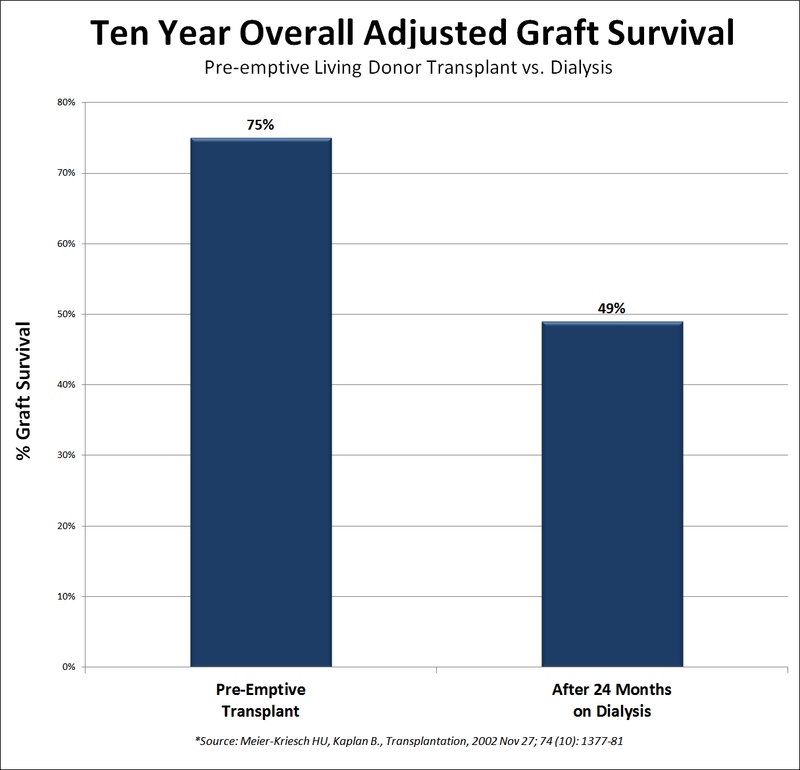 Transplantation is far superior to long-term dialysis. Transplant recipients generally live twice as long as those who stay on dialysis and transplant recipients are not restricted by the challenging routine of dialysis therapy. 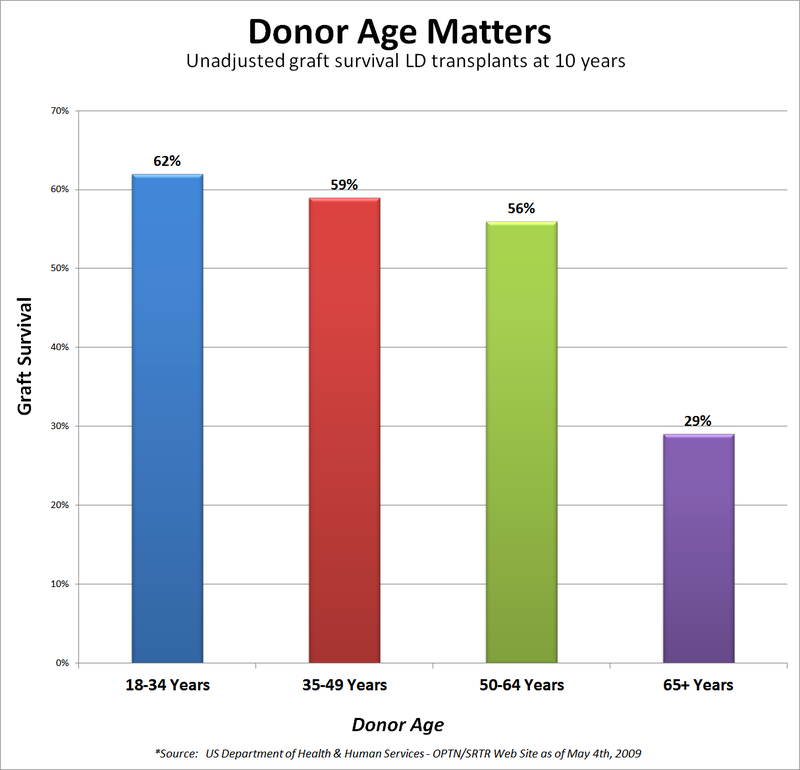 These factors and the quality of life improvements lead many people to seek transplants. In pursuing a transplant, there are two options: a deceased donor transplant or a living donor transplant. Kidneys transplanted from living donors are superior because they last nearly twice as long as kidneys transplanted from deceased donors. Once a person has made the decision to pursue a transplant, time matters. Studies indicate that the less time the patient is on dialysis, the better the transplant outcome. Receiving a preemptive transplant and never going on dialysis leads to higher transplant success rates. Not only does time matter but the donor - recipient match also matters. The most significant matching variable that can be improved via paired exchange is the HLA match. The donor age is less significant but can also be improved via paired exchange. 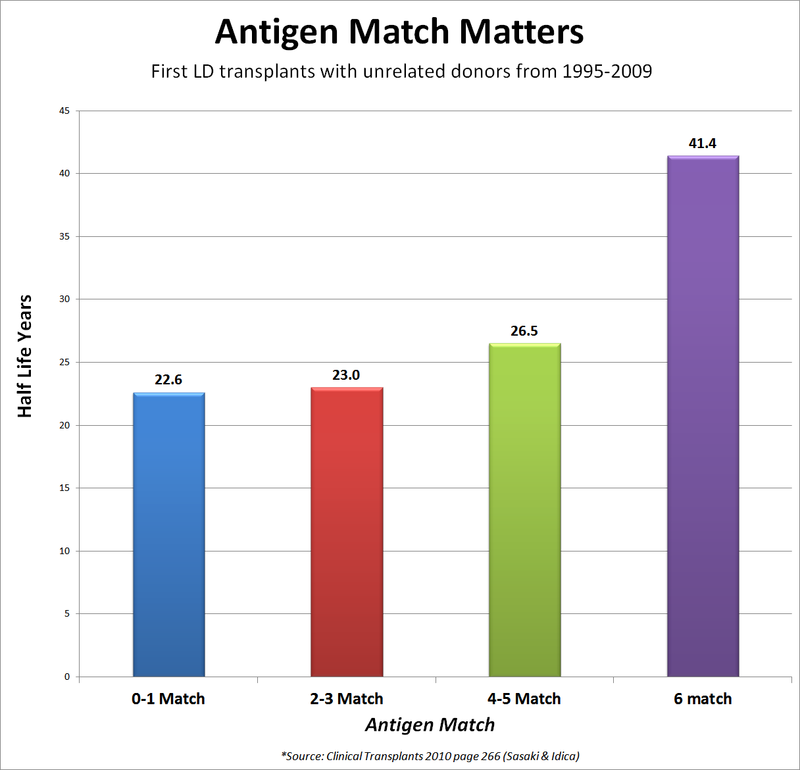 Below are charts that show the impact of the HLA match and donor age on transplant outcomes. You can make a difference by joining the ranks of over 50,000 living donors who have donated their kidneys to people facing kidney failure. Since 1954, when the first successful living donor transplant took place in Boston, living donors have been giving the gift of life and making a difference. This tradition has allowed thousands of people facing kidney failure to live longer, healthier lives, free from the challenging routine of dialysis. Donating a kidney not only helps the person who receives the kidney but also shortens the deceased donor wait list, helping others get a deceased donor kidney sooner. Also, all living donors are awarded points for their donation so if they ever need a kidney later in life, they will be given priority on the deceased donor list. There are three types of living kidney donation; direct donation, paired exchange donation and Good Samaritan donation. With direct donation, the donor generally knows the recipient and donates directly to them. If the donor is compatible, the donor's kidney can be transplanted directly into the recipient. One problem with direct donation is that direct donors are often incompatible or poorly compatible with their intended recipients - this means they are not the right blood type or do not pass a cross match test with the intended recipient. However, a donor can still help their intended recipient get a transplant if they are incompatible by participating in a paired exchange. Below is an illustration of the three hurdles that direct donors must clear before they can donate their kidney in a direct donation. In a paired exchange, a donor will donate their kidney to another recipient in exchange for a compatible kidney for their loved one. In the example to the right, the first pair, a mother and her son are incompatible. The second pair, a husband and his wife are also incompatible. In this exchange, the mother donates to the wife of the second pair and the husband donates to the son in the first pair. 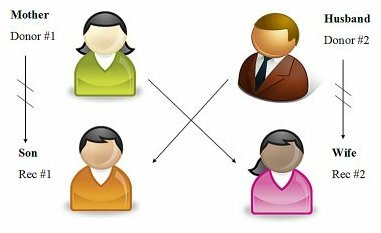 Often compatible pairs enter into a paired exchange to get a better match donor. With Good Samaritan donation, the donor is giving to a stranger which initiates a chain of transplants. Chains are a way for one Good Samaritan donor (aka Non Directed Donor) to help many patients get transplanted. Chains are also revolutionizing the paired exchange process by facilitating better donor-recipient matches including some six antigen matches, which is important because a great match allows the transplanted kidney to last longer. Many Good Samaritan donors choose to start chains because it is a way to help more than one person suffering from kidney failure. One chain typically facilitates anywhere from 2 to 30 transplants. If you want to donate to someone in need of a kidney, the NKR will give you the best opportunity of helping the most patients with your gift. 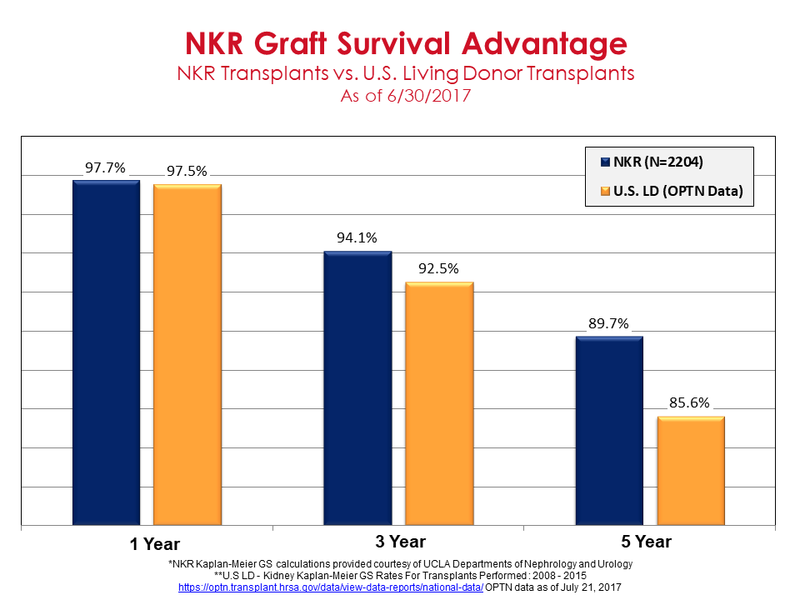 The NKR provides patients the best chance of safely finding a well matched donor which increases graft survival and is correlated with more kidney life years. The NKR works with all the top transplant hospitals in the United States and has facilitated more exchange transplants than any other exchange program in the world. 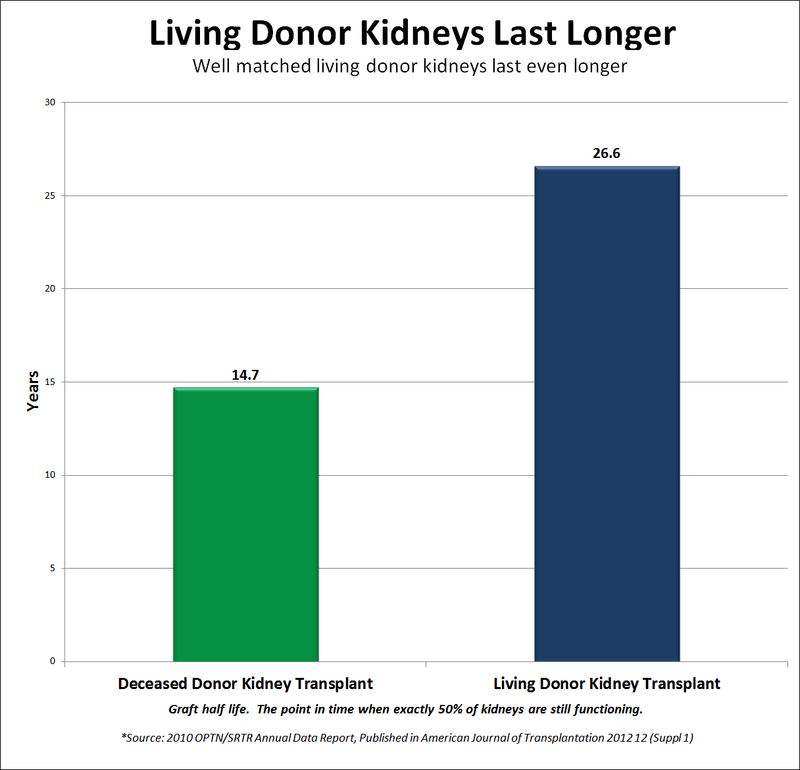 Additionally, the patient outcomes from transplants facilitated by the National Kidney Registry exceed the average U.S. living donor transplant outcomes. We believe this is driven by the improved donor - recipient matches available through the National Kidney Registry which is the largest living donor pool in the world. There are some transplant centers that attempt to provide paired exchange services from a "single center." This approach may make the logistics easier (no need to ship kidneys or coordinate surgery dates with other centers) but this "single center" approach cannot equal the NKR's ability to improve HLA and donor age matching which improves transplant outcomes (i.e. the kidney lasts longer). This is because paired exchange is inherently a numbers game and the NKR is the largest paired exchange program in the world and the NKR has, by far, the biggest pool of donors. The larger the pool of donors, the better the matches. Single center programs have limited ability to "repair" a real-time swap failure (e.g. recipient experiences complications during surgery and cannot receive the kidney). If a single center program cannot "repair" a failed swap, the patient, whose paired donor has already donated, is left without a kidney. Single center programs do not have the volume to repair failed swaps quickly. The NKR has successfully repaired many real-time swap failures. The NKR’s solution for resolving real-time swap failures is outlined in our Medical Board Policies. Additionally, paired exchange presents unique challenges related to protecting donors from the financial exposure related to un-covered donor complications. The NKR has a Donor Protection Program which eliminates this exposure. If you are considering enrolling in a single center paired exchange program, you should request a written copy of the center’s 1) policy for repairing failed swaps and 2) policy for protecting donors against un-covered donor complications. If a written copy of these policies are not immediately available or if they are filled with legal language that protects the hospital, you should consider enrolling in the NKR program where these important risks are clearly addressed. You will be matched as quickly as possible so your paired recipient can be transplanted as soon as possible. Your paired recipient will get the best matched donor possible because the NKR has the largest living donor pool in the world. You will not be required to travel to the recipient center in order to participate in a swap. We will minimize the risk of a real-time swap failure where the patient could be left without a kidney. You will be provided with a donation insurance policy at no cost. You will be matched in accordance with your donation timeframe so that your surgery date and recovery period fit your schedule. The patients that you help will get the best matched donor possible because the NKR has the largest living donor pool in the world. We will work hard to maximize your donation by facilitating as many transplants as possible in your chain. You may donate at any of our many Member Centers which will minimize your travel time and costs. By checking this HIPAA Release you agree to allow NKR to store your information and to contact NewYork Presbyterian-Weill Cornell Transplant with the information you provided.